Brian Switek has a colorful post up on a recently discovered site of mammoth scavenging. You should read his post, but here is the short version. Virginia's Saltville Valley has been a productive source of Pleistocene fossils for decades. For some reason, the paleontologists have worked on the site till now have given most of their attention to big herbivores, such as our friends the mammoths, and ignored (or failed to find) the carnivores. Recently, a team working there came across the bones of a short-faced bear. Short-faced bear were one of the largest bears that has ever lived. One of their distinguishing features is their smashed in muzzle (but you had already figured that out, right?). At the same time, they found a mammoth calcaneus (heel bone) that shows teeth marks of a bear. Brian asks, "why would these carnivores have been gnawing on the mammoth's feet? Surely there were meatier parts of the mammoth's body that would have been preferred by these large scavengers." I have a possible answer to that question. Michael Adams recovered the first of the great frozen mammoths in 1806 and it was also the first intact skeleton of a mammoth to be recovered and mounted. When he arrived at the carcass, scavengers had already eaten or carried off all the organs and most of the flesh. He specifically mentions polar bears as one of the scavengers. The only unscavenged parts were the least meaty parts of the head (scalp and upper part of the face) and two of the feet. It appears that the thick, calloused skin of the sole kept scavengers from going after the feet right away. It might be that Saltville bear was late to the buffet and that the feet were the only things left. 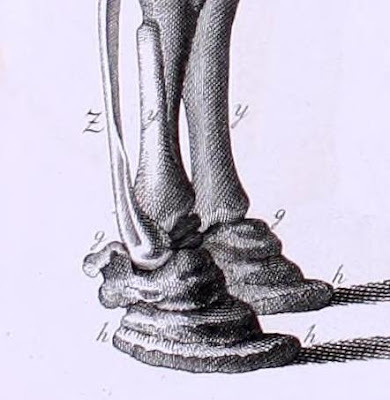 When Wilhelm Tilesius mounted the skeleton, he left the skin on the feet. This annoyed many anatomists of his day, who were more interested in the skeletal structure, but it's helpful to us. Detail of a mammoth's hind feet from Tileseus' original etching of the Adams mammoth. Notice the thick sole. Fore feet of an Indian elephant, the closest li8ving relative of mammoths. Note the tip-toe posture. As Brian points out, there is quite a bit of meat and fat on an elephant's foot. Like camels, elephants walk on tip-toe. Their feet have a thick sole and a large fat pad between the sole and the palm. This acts as a shock absorber when the come down with their great weight in each step. To visualize the mechanics, place you hand on a flat surface like a table or deck top. Now raise your palm so only the tips of your fingers touch the surface. If you places a tennis ball under your palm, as a pad, you'll have a rough analogy for an elephants foot. That ball of fat would have been a tasty source of energy for any scavenger who took the time to gnaw through the sole of the foot. However, as long as there was easier flesh to be had, they would probably have ignored the feet. Of course, it might have been that the Saltville bear just liked feet. Who knows what a bear thinks?